Everything's ship-shape in the decor of this ocean-view covered deck. The modernized hurricane lanterns on the table neatly repeat the rows of vertical slats of the wood arm chairs. The clapboard walls, interior window shutters, and wood deck create even and harmonious parallels, with just enough change in size and color to add interest. Double doors and flanking windows create the feeling of hospitality while serving the practical purposes of facilitating use by partygoers. Enjoying the ocean view from inside when weather dictates is enhanced by the windows' modern insulating technologies. But it's those navy blue accents that make the white look so crisp, dapper, and inviting. 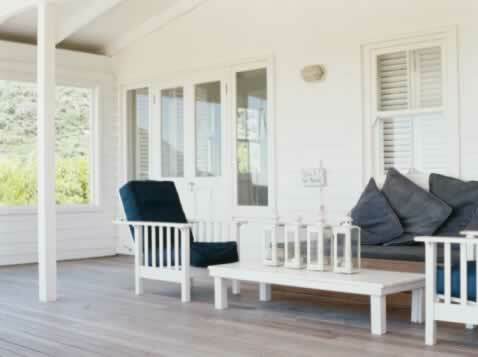 The cushions on the chairs and storage bench are generous in size and invite guests to sink down into them and relax. Sinking isn't always a disaster, as it turns out.